Natasha Trethewey, Emory professor and former U.S. poet laureate, has been awarded the 2016 Academy of American Poets Fellowship. Past recipients include Gwendolyn Brooks, Robert Frost and Ezra Pound. Natasha Trethewey, Emory professor and former U.S. poet laureate, has been awarded the 2016 Academy of American Poets Fellowship for distinguished poetic achievement. The fellowship, which comes with a $25,000 stipend, is presented to one poet each year in recognition of distinguished poetic achievement. Established in 1946, the award is given in memory of Pulitzer Prize-winning poet James Ingram Merrill and was the first of its kind in the United States. Fellows are nominated and elected by a majority vote of the Academy’s Board of Chancellors. Past recipients include Gwendolyn Brooks, Robert Frost and Ezra Pound. “Natasha Trethewey’s poems plumb personal and national history to meditate on the conundrum of American racial identities," says Academy of American Poets Chancellor Marilyn Nelson. In response to the award, Trethewey noted that she was pleased to be chosen by a group of her peers, the chancellors of the academy. Her appointment, which coincided with the 75th anniversary of the library's Poetry and Literature Center, was marked by outreach and travel across the nation. During her tenure she undertook a series of reports, titled "Where Poetry Lives," for PBS NewsHour with chief arts, culture and society correspondent Jeffrey Brown. 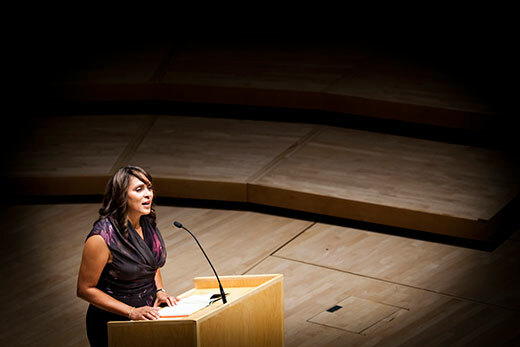 In 2013, Trethewey was inducted into the American Academy of Arts and Letters. She is author of the Pulitzer Prize-winning poetry collection “Native Guard” (2006), which Atlanta's Alliance Theatre adapted for the stage as part of the National Civil War Project. Other collections include “Bellocq’s Ophelia” (2002), “Domestic Work” (2000) and “Thrall” (2012). Trethewey is also the author of a book of creative nonfiction, “Beyond Katrina: A Meditation on the Mississippi Gulf Coast” (2010). Her professional honors include fellowships from the National Endowment for the Arts, the Guggenheim Foundation, the Rockefeller Foundation Bellagio Study Center, and the Bunting Fellowship Program of the Radcliffe Institute for Advanced Study at Harvard. In 2012, Trethewey was named the state poet laureate of Mississippi.